Protesters and riot police have clashed in central Athens today during a protest calling for the release of prisoners arrested during last month's riots, as farmers continued a week-long road blockade over prices. The clashes occurred outside the University of Athens, as police charged with batons and pepper spray, while protesters used sticks and stones. Several hundred people were involved in the protests, and around 300 continued a march through the town centre. The International Herald Tribune reported that most participants were anarchists. 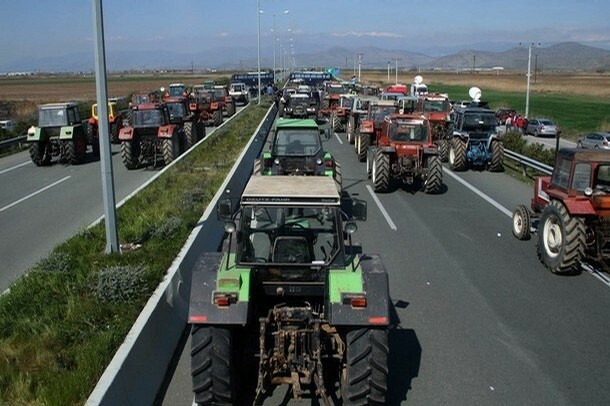 Also this week, around ten thousand farmers have been blocking major highways and border crossings with tractors over prices, after government talks broke down. Protests at Greece's third largest airport in Crete finished earlier this week, after the runway was blockaded by tractors and burning tires on Tuesday. There where a good deal beyound 2000 participants, and the demonstration where called for by a anarchist popular assembly at the polytechnic university in Athens. Also there where demonstrations in other cityes on Greece, at the same time and on the same issue. The end of the demonstration meant aggresion from the police followed by a controlled and defensive riot and retreat by the demonstrators which on this day had laid down almost all of their weapons. This is a summary of a eyewittnesreport.